I went to a good friend’s going away party Thursday night. Got home about 6am Friday morning and suddenly wasn’t tired anymore (despite not being able to keep my eyes open sitting at her kitchen table ten minutes earlier). Went for a bit of an Exploration in Collingwood; to somewhere I have been a number of times. 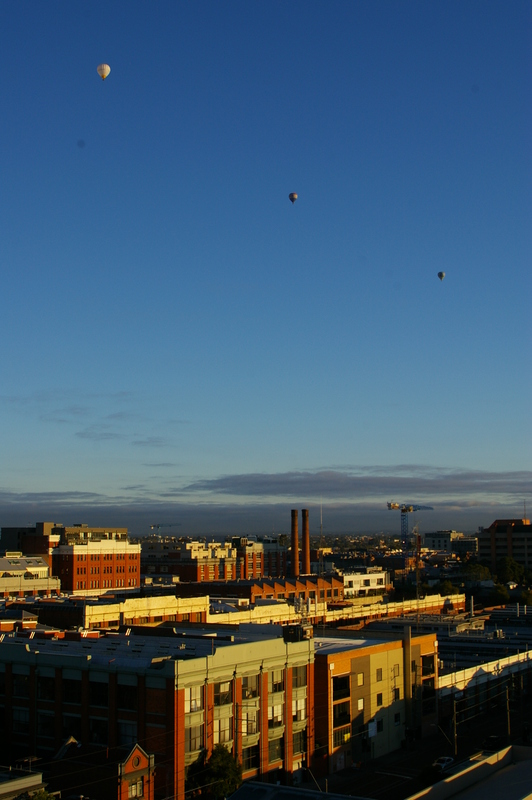 I watched three hot air balloons make their way over Collingwood and disappear into the distance. Morning sunshine; lovely. I also scored a cool Everfresh sticker which I found stuck to in internal silo wall; it is now displayed proudly on my handbag. ~ by Kitten of Doom on April 17, 2010. That pic was way awesome to wake up to. I like this one more though, it’s like they’re in formation. I went to your Flickr but the newest pics there were from 2007. You must have another Flickr I don’t know about. Unless I was doing something wrong, which is impossible. I don’t know why you thought they were only ok. Those Holga shots were awesome. I don’t think I’ve ever seen any before, or at least if I did I hadn’t realised what they were shot with. They have a cool ethereal/vintage look to them.